The last time I purchased a book of fiction or poetry was for the senior year college literature elective I never finished (I’m not much into the whole fiction thing). For years I’ve resisted reading or even caring about the world of fiction (though I did read a few of the Harry Potter books). Since college my reading list has variously consisted of the New York Times, The Philadelphia Inquirer, Newsweek, The Christian Century, Sports Illustrated, The New Republic, and a somewhat regular diet of books about theology, ministry and occassionally baseball. Note the lack of anything poetic or fictional. So today I was listening to Fresh Air on National Public Radio when I hear the latter half of an interview with poet Mary Karr on the occassion of the release of her newest collection of poems, Sinners Welcome (this link takes you to the NPR Fresh Air website, which links to the Amazon.com site for the book. When you go to Amazon from the NPR website, NPR gets a portion of the proceeds from your purchase!). 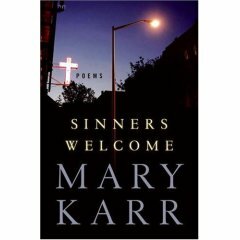 Dr. Karr is an adult convert to Catholicism who teaches poetry at Syracuse University. In the interview Dr. Karr revealed her piety, appreciation for things sacramental, and a humble, servant-minded faith in Jesus Christ. It was wonderful to hear, especially on National Public Radio (listen to the interview here). So wonderful, in fact, that I purchased the book at the next Borders bookstore I could find. So, two things to add to your to-do list: Listen to this interview at the Fresh Air website, and get this book. I thumbed through her book recently, I found it to be a fascinating read. As a poet it’s nice to see that relgious voices are being taken more seriously. Oh, nuts! I know a place where you could have gotten a great deal on this book! It’s required reading for a sem class.